This was a test produced in order to achieve a similar effect to a “Pin Art” toy which creates images by extending an array of pins. This effect is quite simple actually, and the basic concept is to map the luminance values of a source image to geometry displacement. The brighter the pixel, the greater the displacement and effectively, the higher the pin rises. The main problem in achieving this is that building any type of geometry and displacing it with the pixel values will distort the mesh. This is because the left vertices of a rectangle may be displaced 10% while the right vertices may be displaced 80% due to neighboring brighter pixels. The solution to this is to not displace geometry, but rather displace a point, or even better, a spline. Since a point is one dimensional, it can be directly mapped to a single pixel. Once the pixel value is derived, the point shifted, and the spline displaced, any object can then be attached to the spline. In the example below, 3dsmax has a feature which will allow one to convert a spline to a renderable object with a configurable thickness and number of sides at render-time. 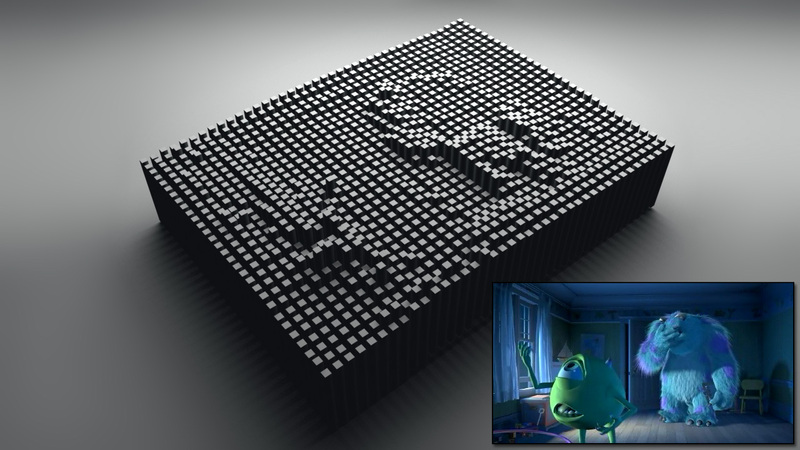 The example above has an array of 50×30 splines, which are converted to 4-sided rectangles at rendertime, and are displaced using an animated map, in this case the “Monster’s Inc” movie trailer. Of course, greyscale images/maps would work better since pixel values are based on luminance and the pin array can be of any desired resolution. Renowned director David Fincher used a similar technique for Nince Inch Nails’ “Only” video. You can check it out here. Directed and created by Richard Rosenman. "Monster's Inc." trailer property of Disney / PIXAR Animation Studios.